Back when I was in 4th or 5th grade I got a new pair of glasses that automatically darkened in the sun. I thought they were really cool and so did my classmates. I was the only kid that any of us knew that had them. A year or two later when I traded them in for a new prescription I decided to get normal lenses. It was soon after that I started suffering from reoccurring headaches. My mom took me to the doctor a few times to try and figure out what was wrong. I finally figured it out myself. I had gone about two years without seeing the sun at its full brightness and I was getting headaches from the glare. I started wearing a baseball cap and my headaches went away. Congrats on the 601st comic! Also, don’t stare at the sun, unpleasent effects. Haha, I work in an optical shop, so I’m really getting a kick out of these replies…oh wait, wrong site. But seriously, I sell glasses for a living, and UV light (plus glare from sunlight) can actually be very damaging. I’m saying this hypocritically, but even ghetto clip-on sunglasses can be a lifesaver during long road trips etc etc. But that’s beside the point. Congrats on 600+ comics! May your next 600 be as awesome as these. I actually went through about a month ago and read every one available from the start, and I’ll probably buy the books after my B-day when I have some money (trips to Vegas are expensive). The best part I love about Biff is that it’s accessible to everyone; my parents who love the Zits coffeetable books LOVE Biff, but it’s also sometimes got some inside “nerd humor” that makes me smile just a little more inside. My friend went about a month wearing sunglasses 24/7 when he was outside, then one day he just decided to take them off around sundown and for about 2 hours his eyes watered cause they weren’t use to the sunlight. I think Micah broke the code. Exactly the same thing happened to me when I was in school! 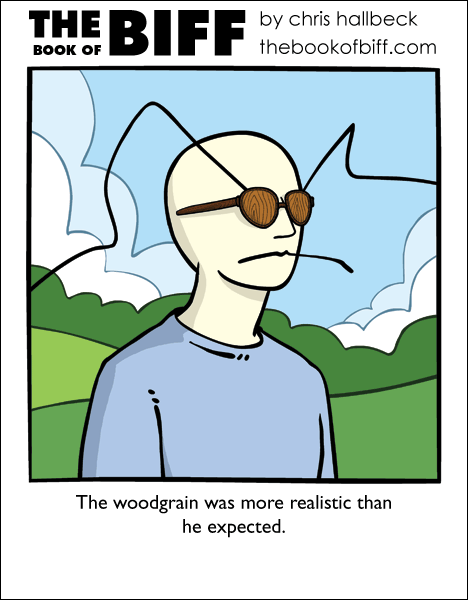 The headaches, that is, not the wooden lenses. Now I just get headaches from the glare due to sitting in a dark office all day reading webcomics. Have there been other comics that don’t use the word “Biff” in the caption? And two many typos day. I too wear tinting glasses. My old glasses had transitions too. I never realized how much I loved them until the first time I walked outside without them. And I live in Arizona so the sun is super unforgiving on my now unprotected eyes. Great now I have splinters in my eyes…. I don’t get this comic. I wore sunglasses in school, I have no trouble with sunlight, but the artificial florescent tube lights hurt my eyes and caused me headaches. So I earned the nickname Shades, and I got to be the cool kid and everyone knew who I was. All because of florescent tube lights. I had those transitioning lenses once too, but found they didn’t work so great for me when driving. It’d be brilliantly sunny outside, where I have to look, but shady INSIDE the car where the glasses are. So they didn’t darken enough for driving on a sunny day. Now that I wear contact lenses and I can just have plain old regular sunglasses for when I go outside. Oh I’d bet it’s Chris’s childhood objects week. Haha. Did someone already say that? Yay, comic #601! It’s kind of scary imagining 600+ ideas for a single person to give us a laugh.